This is not a big performance, and she’s not subtle either. She’s something better. It’s time we stop taking Emma Thompson for granted. In her best films, she’s world-class, and there’s no one who doesn’t think she’s at the very least permanently great and consistently interesting. No one else has her particular magical power of elevating the IQ of everyone around her and imparting an aura of braininess on her few truly bad projects, from which she always survives unscathed. The Children Act, A24’s adult fare for the fall slate, is not one of Thompson’s best films, but it certainly isn’t bad. Far from it. It’s better than this year’s other Ian McEwan adaptation, On Chesil Beach. The Children Act is much more adaptable novel, with plenty of dialogue and exciting moral questions, none of which are the ones you think you’re going to hear about. 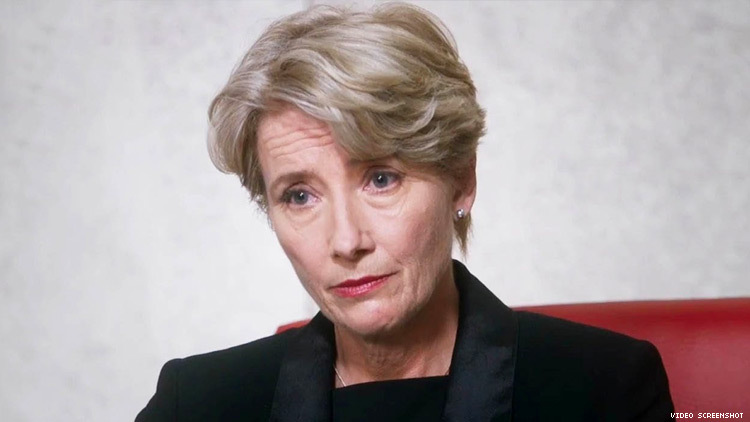 The premise: Emma Thompson is Fiona Maye, a London judge in the family court, who occasionally handles very difficult cases involving the lives of children. When we meet her she has just permitted a hospital to separate conjoined twins at the peril of one. Her next case is similarly messy: A young Jehovah’s Witness, just months shy of legal adulthood, is refusing a blood transfusion that would save his life. She must decide whether the hospital will save his life. Now, Maye has already made up her mind, but in the interest of fairness, she handles the case meticulously and efficiently, with intellectual rigor, open ears, and a knack for immediate human connection. (The boy in question is played, very well, by Fionn Whitehead, whom you’ll recognize as the best young actor from Dunkirk.) Before the film is halfway over, a decision is made. And then for the rest of the film, Maye must deal with the unforeseen consequences of the decision. This is where McEwan succeeds most as a storyteller. Here adapting his own novel, he creates scenes of back-and-forth for Thompson and Whitehead that never explode but always simmer with intelligence. The surprises are small and complicated but nonetheless convincing and highly involving, and occasionally quite daring. A lot of things could go wrong here, especially in the second half. The film is directed unobtrusively and tastefully by Richard Eyre, and he manages an intimacy that does not call attention to itself. Most of the praise can be aimed at Thompson, however, who has more technique in one eyeball than many actors do in their whole bodies. She doesn’t take any big risks here, as she did in last year’s The Meyerowitz Stories. This is not a big performance, and she’s not subtle either. She’s something better: She’s direct and controlled and precise. The film is bogged down notably by the misshaped secondary plot between Thompson and Stanley Tucci, whom I like a lot. Her husband, a professor in the humanities, announces in his first scene that he is thinking about having an affair and he thought he should let her know; that should tell you something about their relationship. Fiona’s reaction is typical, and their following scenes don’t steer clear of cliche as well as they might. Tucci does as well as he can with McEwan’s uncharacteristically thin character, but it isn’t quite enough to keep the relationship from feeling like a dramatic distraction. There’s just not enough juice to squeeze from it. My judgment is that the two halves of this film should have been separated, even if it meant one would die and the other would thrive.